Congratulations on being elected as a State Officer Candidate! You have a rewarding and busy term ahead. Please be sure to read all information contained on this page as it provides information on state elections, officer responsibilities, and information that must be returned to the state office. You have an action packed schedule during the State Leadership Conference (SLC). A detailed schedule of events relating to SLC will be available at a later date. State Officer Candidates (SOC) will have various assignments during conference that may conflict with their chapter schedule. The assigned events take precedence over chapter activities. All chapters of SOC must make housing reservations by the hotel cut off date. SOC will be roomed together according to a list determined by the state adviser; therefore, they should not be included in the chapter housing lists. 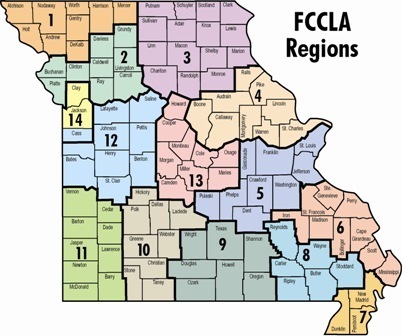 Information on housing for SLC is available in the SLC release for advisers posted on the MO FCCLA webpage. Both SOC and their advisers have various meetings during SLC. Please make sure to refer to the conference program and detailed schedule for these meeting times and locations (to be released soon). At this time officer candidate should plan to be at Tan-Tar-A no later than 1:30 pm on Saturday and should not plan to leave until after the NLC Delegate meeting which is scheduled to end at 12:30 pm on Tuesday. All officer candidates need to take the 5 Voices Leadership Assessment (link to the left) prior to arriving at SLC. You need to bring a printout of your complete results and give to the state adviser at your orientation meeting. Both SOC and their advisers have various meetings during SLC. Please make sure to refer to the program and detailed schedule for these meeting times and locations (to be released soon). Advisers you are expected to assist with various events. This will give you a chance to learn the expectations as you plan the upcoming year. Please plan to bring an additional chaperone if you are bringing additional students. Your chapter will be given priority in the main hotel buildings. It is important to remember that your SOC will be busy most of the conference and will likely not be around you. Remember that SOC are not to have their cellphones or other electronic devices during these activities. Please refer to the detailed schedule as to where they are if you need to speak with them. If you have difficulties finding them or need assistance on site please contact the state adviser. Please use these documents to help you prepare for your term.